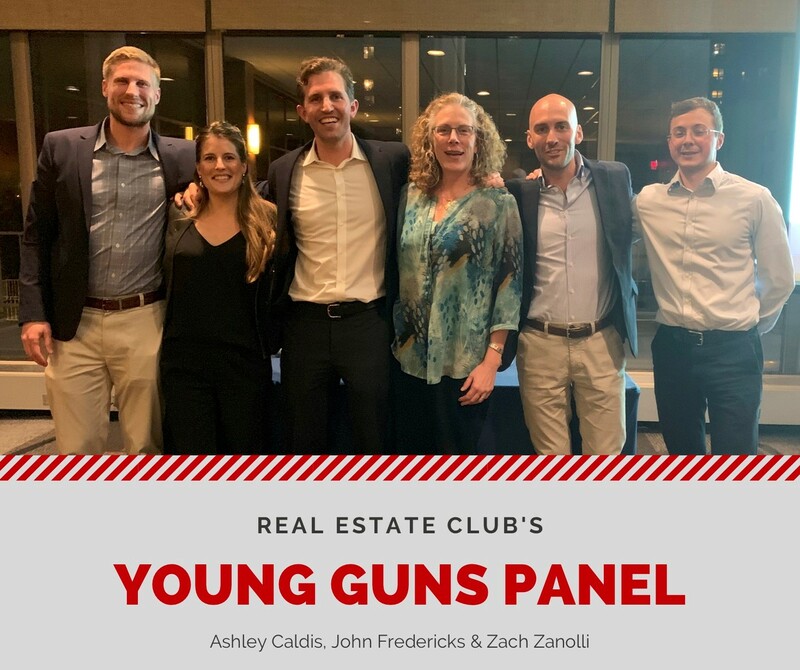 The Real Estate Club held their last meeting of the academic year on Thursday by hosting a “Young Guns Panel” with three recent alumni guest speakers, Ashley Caldis (BBA, 2009), John Fredericks (BBA 2014), and Zach Zanolli (MBA, 2015). The meeting began with Club Executive Board elections for the fall semester. The upcoming Presidents of the Club will be graduate students Andy Evans (MBA 2020) and Jared Schnoll (MBA 2020) and Vice Presidents will be David Clark (MBA 2020) and Mike Crivello (MBA 2020). After speaker introductions, the floor was opened, and club members were able to ask panel members a variety of questions. The “Young Guns” shared information about recent deals, their experiences as students in Madison, their personal journeys within the industry and their passion for real estate and gave advice for current students entering the workforce. All speakers gave thoughtful and beneficial responses to the members in attendance. As recent graduates of the program, these speakers easily connected with both graduate and undergraduate students. The panel shared their stories about the real estate industry and encouraged Club members to be passionate, open-minded, and motivated in order to create great experiences of their own in the industry. We would like to thank the Real Estate Club and all its members for another great semester! We look forward to seeing returning members, new students, and more guest speakers in the Fall. 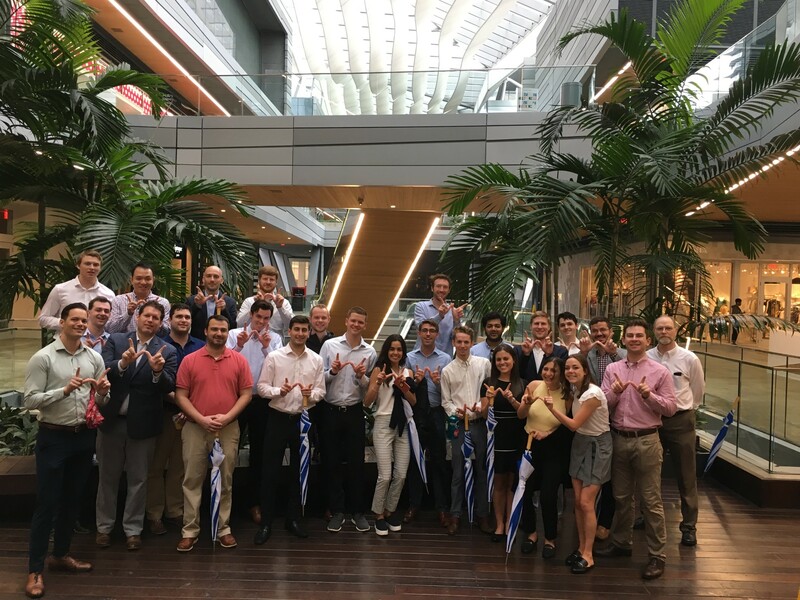 The Wisconsin Real Estate Club and chaperons Sharon McCabe and Joe Walsh took a group of graduate and undergraduate students down to sunny Miami, Florida for their Spring Semester Field Trip last week. The MBA’s and BBA’s were eager to explore the booming Miami market, a city the Real Estate Club had not visited in over five years. The trip began on Wednesday evening with a WREAA sponsored Networking Event at Batch Gastropub in Miami’s downtown Brickell neighborhood. Over appetizers and refreshments, club members casually discussed what the next few days would entail and what they were eager to learn. The night ended at rooftop bar, Sugar Miami, located at the Brickell City Centre, where the group would be touring the next morning. The group met Thursday morning back at Brickell City Centre for their first introduction to the Miami market. City Centre, a development by Swire Properties, is a $1 billion, mixed-use project that spans over 5 million square feet of retail, multi-family and hotel properties. President of Swire Properties, Kieran Bowers, gave the group an informative presentation discussing the history of the 200-year old company, the timeline and execution of this major mixed-use development, and an overview other projects that Swire is currently developing throughout Brickell and downtown Miami. The student's understanding of the Miami market continued to expand during their next stop at HFF, where Luis Castillo and his team gave an extensive Capital Markets Presentation. The team gave an overview of HFF and its capabilities, discussed the current economy and trends of the Miami market, examined capital allocation and current debt and equity markets, and finished with an overview of HFF's recent deals and case studies. Students agreed that the presentation was extremely helpful in understanding Miami’s real estate market. The Club then headed to Miami’s Wynwood neighborhood. Wynwood is an up-and-coming, artistic area best known for its industrial look, wall graffiti, and for hosting the Art Basel Mural Festival. The group met with “founder” of the neighborhood, David Lombardi, and his team at Lombardi Properties. David discussed the history of the neighborhood and the fruition of his dream to develop the area. Lombardi Properties, a close-knit family company, has developed and renovated many buildings in the neighborhood and has greatly encouraged the arrival of retail and artistic showrooms throughout the area. The Real Estate Club explored the unique neighborhood and enjoyed viewing the celebrated mural art. The group gathered with alumni at the Welcome Event, hosted by the WREAA, at Wynwood Kitchen, just next to the famous Wynwood Walls. Over delicious Spanish food and refreshments, students conversed with numerous alumni about their impressions of Miami and their experience so far. Alumni Jared Brunnabend (BBA 1999) and Felipe Izquierdo (MBA 2008) met the Club for lunch at their next stop, the famous Versailles Restaurant. Over discussion with alumni and fantastic Cuban cuisine, students got another taste of Miami. Most of the Club members agreed that this was their favorite meal, and they truly enjoyed and appreciated meeting with the two alumni again. The Real Estate Club then moved to their final activity on the itinerary—exploring residential real estate in Miami by boat! Students enjoyed some of the Florida sun and the views of multi-million-dollar mansions located on the Venetian Islands, or Millionaire’s Row. After learning about office, retail, multi-family, industrial, and hotel aspects of the Miami market, this was a great look into the residential aspect of downtown Miami. Thank you to all involved for their time and commitments in helping to make this an incredible trip. We would especially like to thank alums Jared Brunnabend (BBA, 1999) and Felipe Izquierdo (MBA, 2008) for taking the time to attend nearly all the events and for their help in organizing this memorable trip to Miami! 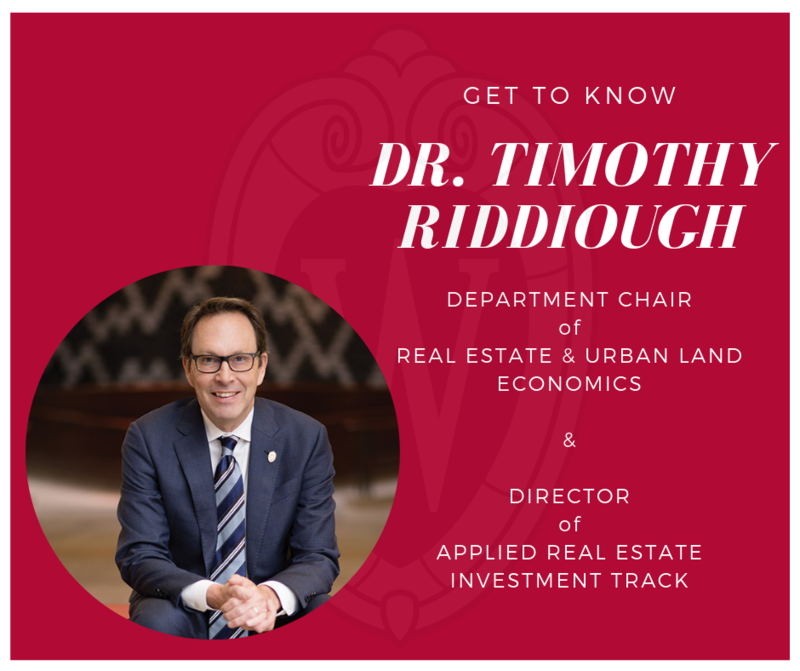 James A. Graaskamp Chair and Real Estate and Urban Land Economics Department Chair, Dr. Timothy Riddiough, has been involved in the Real Estate Program at Wisconsin for over 40 years. He started at UW-Madison as an undergraduate student in 1976, and later earned his Ph.D. from UW-Madison in 1991. He was a tenured professor at MIT before returning to Madison in 2001 as a faculty member and has been on campus since. As Head of the Department, Tim represents the Graaskamp Program with presentations and speeches at conferences all over the country and the world. He is best known for his work on credit risk in mortgage lending, mortgage securitization, real options, REIT investment and corporate finance, and land use regulation. Tim is also a past recipient of the American Real Estate and Urban Economics Association Best Dissertation and Best Paper Awards and is a fellow at the Homer Hoyt Institute for Advanced Studies and the Real Estate Research Institute. He is actively involved on campus, teaching various graduate-level courses since 2001 and an undergraduate-level Real Estate Finance class last semester. He serves as a mentor and a resource on campus and keeps an open office door for undergraduate and graduate students alike. In this interview, Social Media Intern Maria-Elena Svigos asked Tim a wide range of questions about academics, his world travels and his interests outside of real estate. Read on to learn more about Tim Riddiough! The use of leverage in private equity investment. It looks like many LPs are reaching for yield and using leverage to do so. It might end badly for some or many taxpayers. How technology, demographics and increasing income inequality will affect city form. I couldn’t hold a job in the private sector. Announcing the naming of the Graaskamp Center as a result of tremendous fundraising efforts of our alums and associated stakeholders. A shoe salesman. I worked my way through college selling shoes, and it’s always been my backup plan. New Zealand. Been there five or six times now, and always want to go back. On a cruise ship, going just about anywhere. I thought I would hate it when I first tried it out, but it’s the only kind of vacation where I can totally relax – don’t have to worry about a thing. And the experience has this rootless American quality that I find attractive. Best food? Paris, with Hong Kong a close second. If Italy were a city, it would probably place first. Most unique culture? Cambodia, wonderful humble people. Friendliest people? Children in Ho Chi Minh city, a little too friendly (hang onto your wallet). Best museums? Paris, hands down. Most interesting architecture? Siem Reap, Cambodia. Amazing temples with these even more amazing trees growing in and around them. Coolest skyline? That’s easy, Hong Kong. Best real estate students! That’s also easy, Madison! What are your hobbies? I spend way more time on wine collecting and wine drinking than I should. What are you currently reading? “The War on Alcohol.” It’s about prohibition in the US in the 1920s. There are fascinating parallels between that period and the period we are currently living in. Favorite type of music and favorite artist: Country and Western, Johnny Cash. What are your short-term goals for the year? Try not to screw up as department chair. If everything went as planned, in 10 years, what would your day look like? Sleep till 9, spend part of the day working on the book I’ve always wanted to write, have a good lunch out with my wife, stop over to see my grandchildren (at their place, not mine), cook dinner and have a good bottle of wine, watch a good hockey game. Alternatively, if I have any money left, travel and sight see. Students, alumni, friends and faculty assembled at the Pyle Center last Thursday, March 28, for the presentation of the Innovator Award. 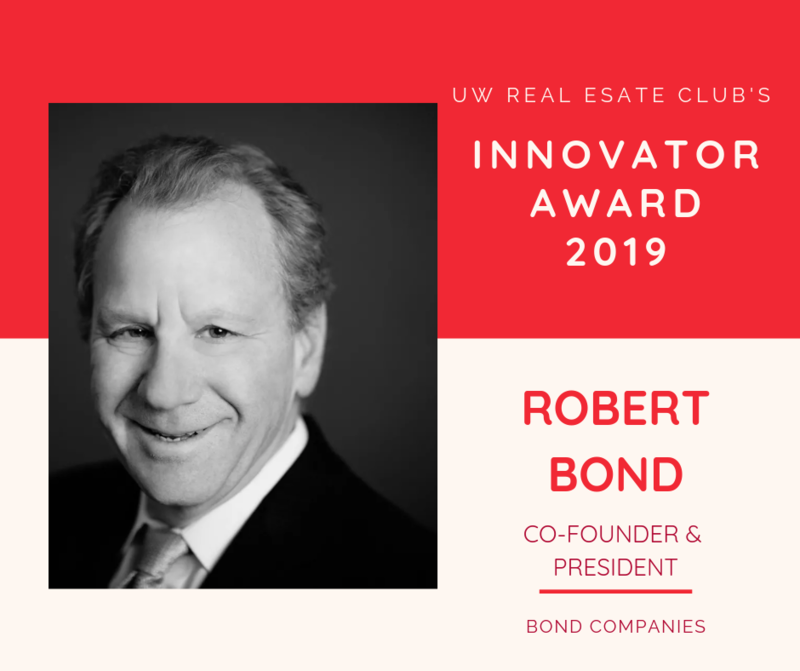 Following a networking reception, this semester’s Real Estate Club Innovator Award was presented to Robert Bond (MS 1983), Co-Founder and President of Bond Companies by Michael Brennan, Executive Director of the Graaskamp Center. The Bond Companies are a leading real estate development and investment firm with a focus in multifamily, office, retail and mixed-use projects and offices in both Los Angeles and Chicago. Robert is head of the Chicago office, and has been involved in hundreds of real estate transactions throughout his 30 years in the industry. As an alumnus of the program and a Board of Trustee member for the Graaskamp Center, Robert has maintained close ties with program and has gone on to represent the Wisconsin Real Estate Program in many impressive ways. His experience in the industry ranges from development and re-development to acquisition and capital formation activities representing several billions of dollars. The Real Estate Club welcomed Alissa Adler (BS, 1988; MS, 1989) to their March 8, 2019 meeting. Mrs. Adler, Managing Principal at Podolsky Circle, boasts more that 29 years in the real estate industry. With experience in asset management, acquisition, advisory, brokerage and real estate investment, she has truly seen all walks of the real estate trade. Alissa began her presentation with some career highlights which include over $1.2 billion in transactions, institutional and entrepreneurial investments, owning and brokering real estate properties, working all around the nation on both the operational and transactional side of a deal, and earning both an undergraduate and graduate real estate degrees. Podolsky Circle CORFAC International is a wide-range real estate advisory that specializes in office, industrial and retail markets offering brokerage, property and asset management and advisory for debt and equity placement. Alissa serves as Managing Principal at the firm and specializes in investment sales, debt and equity placement, due diligence and asset management. 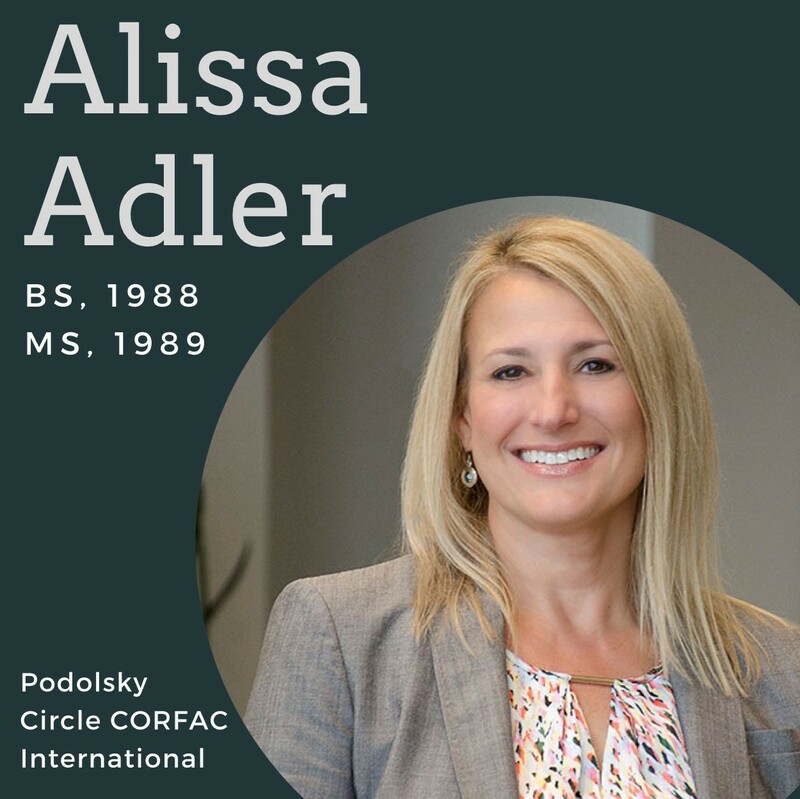 Prior to its merge to form Podolsky Circle, Alissa established Circle Realty Advisors LLC and serves as President. She was also Vice President of Acquisition & Disposition for Duke Realty and Equity Office Properties Trust. To conclude, Alissa shared tips for interviewing. She told students to be thorough with their resumes, work on communications skills, be conscientious with response time and thank you’s and to monitor their social media presence. She shared her five keys to standing out and succeeding in the industry: join organizations, start a personal database, build a network, take notes, and work hard. Many thanks to Alissa Adler for her encouraging words to students last week. The Club’s Innovator Award meeting will be Thursday, March 28th. The WIRE (Women in Real Estate) Club was formed last spring by seniors Ali Petrick and Maddie Fricker, who felt it would be beneficial for women in the UW program studying real estate to come together, network with one another, and learn from professionals. WIRE holds multiple professional events and career panels during the semester, featuring companies such as Wells Fargo, Cushman & Wakefield, Heitman, etc. The student organization also offers social events for members to get to know one another in a casual setting along with a mentorship program between students. As reflected in their mission statement, the organization is committed to building a community of women who wish to pursue real estate careers and to connect these women with professionals, therefore promoting confidence and success in a male-dominated industry. WIRE organizers aspire to create a sense of community among females in the Real Estate major at UW-Madison and give their members a chance to meet and develop relationships with women in the industry through speaker events and club trips. Last weekend, WIRE members traveled to Chicago to visit with some of the industry’s leading companies. The young women met with Barings, MetLife, Ernst & Young, and Norcon and had an incredibly positive experience. They engaged with many alumni of the program, including Managing Director at Barings Real Estate Advisors, Pamela Boneham and Senior Analyst and Analyst at Metlife, Megan Clower and Allison Timmerman. 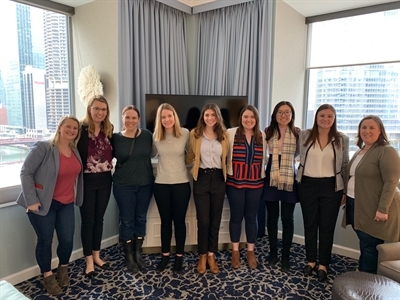 Junior Paige Reimann says that "The WIRE trip to Chicago was a great opportunity to get a chance to learn from women leaders in the industry and to bond with fellow real estate majors from UW. It is an opportunity that will help shape my career as I figure out what aspect of real estate I want to go into. I am looking forward to the trip next year!" 39 companies, dozens of MBA and undergraduate students, all with a common goal: to make connections and start their careers. 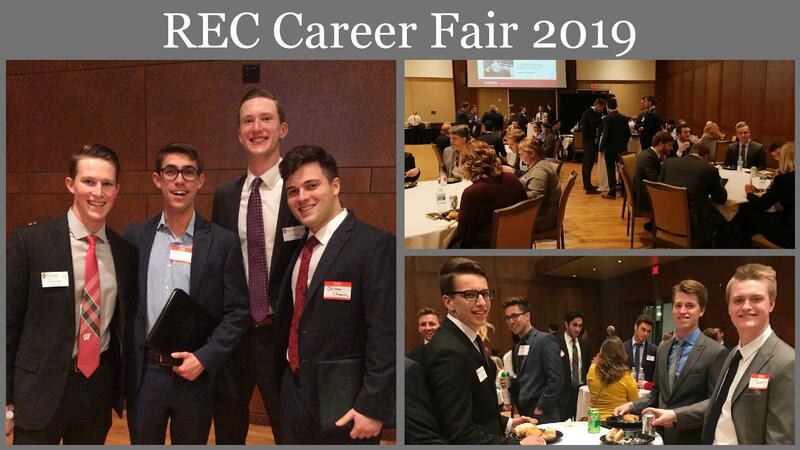 The Real Estate Club Career Fair was a great opportunity for students seeking internships and full-time employment to gain exposure to almost 40 of the industry’s top companies. Small and large companies from both the debt and equity sides and in both private and public sectors come out to meet these students each year. The event was held on Monday February 18, at Union South, with over four hours of planned events. The night started with heavy hor d’oeuvres at large sit-down tables for relaxed dinner and high-top tables for network opportunities with students. Then, the whole group moved to the Varsity Room where booths set up for each company. After two hours of resumé-swapping, networking, and learning more about employment opportunities, both students and employers went down to The Sett for a Reception and casual cocktail hour. The Career fair is an excellent opportunity to recruit for internships and entry level positions. This year’s Fair was a success; but, if you missed it, be sure to showcase your company next year! A big thanks to those recruiters who made the trip, we appreciate your coming and hope you hire many RE Badgers. 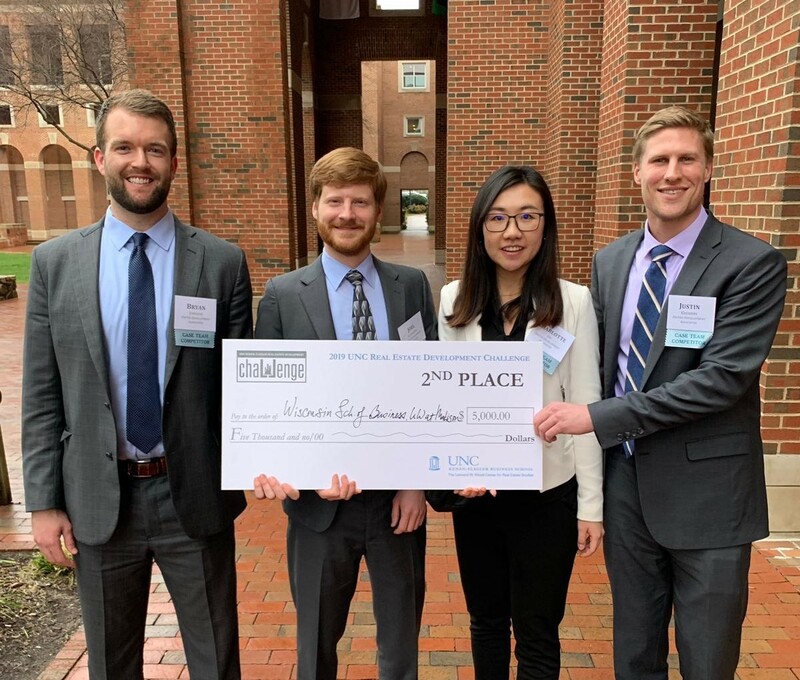 The UW-Madison MBA Real Estate team, Bryan Johnson (MBA 2019), Joel Schneider (MBA 2019), Charlotte Du (MBA 2019), and Justin Kremers (MBA 2019), (pictured left to right above) placed 2nd at the 2019 UNC-Chapel Hill Real Estate Development Challenge. A formidable field of 14 top MBA schools in the country participated in the competition including the Leonard N. Stern School of Business (NYU) , Columbia Business School, Kellogg School of Management (Northwestern), The Wharton School (University of Pennsylvania), and the Haas School of Business (UC Berkeley). The team was assembled following two case competitions within the RE750 class. Case Competition advisor, Arif Qureshi, noted that each team member earned a spot on the team by emerging as a top performer in the following skills: presenter, market research, SketchUp modeling and financial analysis. The team developed a feasibility proposal for a 3.6-acre site in Dania Beach, FL along the waterway. Their proposal encompassed 177 key hotel, 30K SF of retail and 31 water slips financed with a mortgage, city grant, seller financing, limited partner equity, and managing partner developer/operator equity. The project delivered an overall 16% IRR and 2.0 equity multiple while providing a risk mitigation strategy from acquisition to exit. Kenan-Flagler Business School (UNC) received first place honors, and Duke rounded out the top three with a third place finish. This outcome marks the 4th final round finish out of five attempts, making UW-Madison the most consistent team to make the final round in this competition. Congrats to all! 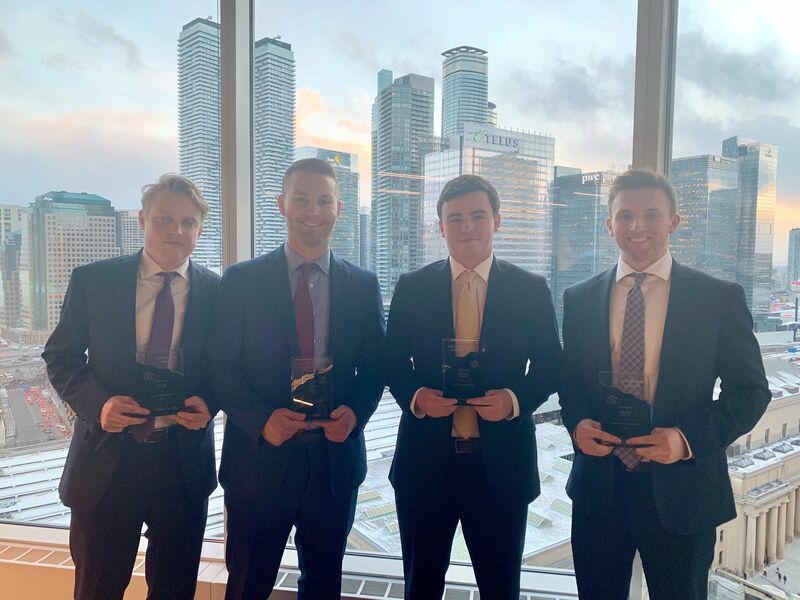 A team of four UW-BBA Real Estate students competed at the 2019 Ryerson Toronto Expand Your Empire case competition in early February. The team, consisting of Andrew Greiner, Mathew Reynolds, Sean Casey and Charlie Monnat (left to right), vied against a field of 12 extremely able teams, and brought home a second-place finish and a $5,000 prize. The team developed a feasibility proposal for a 4.9-acre city-owned site located in Toronto's Etobicoke submarket. Their proposal for the site included 2 towers of housing (436 Affordable, 624 Market), 150 key Hotel, 75K SF Retail, 1,220 Parking Stalls, 100K SF of community plaza space, Mi-Way Bus Terminal, and underground integration of TTC Islington Subway Station. The project delivered 15% IRR and 2.7x equity multiple over a 10-year hold period while providing a risk mitigation strategy from acquisition to exit. Case competition advisor, Arif Qureshi, said “The team gave two outstanding presentations, receiving rave reviews from the judges, and were excellent ambassadors of the UW-real estate program.” The team finished second behind Wharton, with the home team, Ryerson University filling in the top three.A special thanks to David Kim for his continued support of the case competition program at UW-Madison. Congratulations to all! Michael Moran, Managing Director and Vice President of Private Real Estate at Allstate Investments joined the Real Estate Club last Thursday to share his experience in the private equity and debt sectors. Mr. Moran is in charge of managing Allstate’s $10 billion commercial real estate investment portfolio where he is responsible for all aspects of acquisitions and portfolio management for the corporation’s commercial mortgage loan origination program and expansive equity investment activities. Michael graduated from UW-Madison in 1988 with a BS in Real Estate and Finance. After graduation, he began his career at Arthur Andersen and later joined Duff and Phelps. 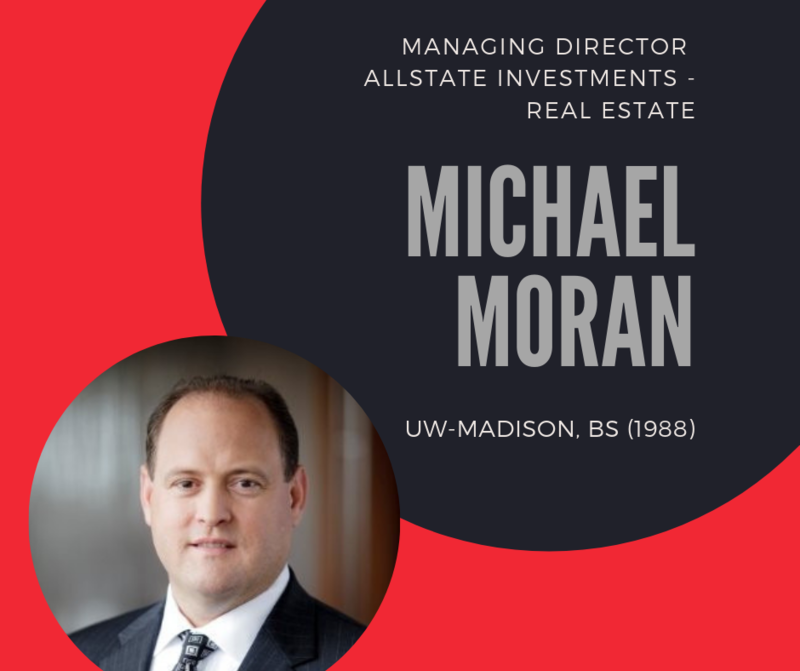 Michael began his career at Allstate in 1996 as an analyst, and has since assumed positions as CMBS Portfolio Manager, Real Estate Investment Portfolio Manager and now, the Head of Real Estate. Mr. Moran discussed Allstate’s investment process, why the process matters to insurance companies, and where real estate investment specifically fit in the equation. He discussed their total capital allocation equation, which is made up of equity and fixed income, and geographically, where Allstate is looking to invest today. Mr. Moran ended his presentation by highlighting some recent deals that Allstate has done in Boston, San Diego, and Chicago, across all property types. He encouraged students to develop the connections they create within the real estate program because they will run into Badgers throughout their whole career! Students of the Real Estate Club enjoyed having Mr. Moran back in Madison to share his experiences and insights into the industry. The Club’s next meeting will be March 7th at the Pyle Center.